It's starting to feel like spring, so it's time to look toward ahead and prep your photo gear for the longer days and warmer temperatures ahead. Step one is to pull out your camera bag, never mind that you haven’t switched lenses since taking pictures of the kids on Christmas morning, we’re going to fix all that. Check your camera strap for wear. If it’s showing signs of weakening, replace it, you don’t want your camera hanging by a thread, literally! This is a great time to clean your sensor. It can be tricky which is why lots of people put it off, but there are a bunch of kits on the market and plenty of tuts to show you how to do it yourself. We like this one from Digital Photography School. Clean your lenses. Don’t just wipe them with the corner of your shirt (we've all done it! ), get an honest to goodness lens cleaning kit like this one from Hoodman and get them sparkling. As you pull out each lens, make sure it has a lens cap (we all know how easy it is to lose these!) and if you're missing any, make a list to replace them. Also, think about what kind of shooting you do most often and what you *want *to be shooting. Did you make a New Year’s resolution to shoot macro? Wide angle? We all know that April showers are ahead so why not pick up a rain cover while you’re at it and be prepared. Do you have enough memory cards? Check the ones you have, and make sure they too are stored properly in a case to avoid damage which can mean losing image files. We like the lifetime guarantee on this Hoodman card. Finally, and most importantly, keep your camera and lenses safe and snug in a bag or case that’s appropriate. Protect your camera against dust and dings and who knows what else by storing it in a proper bag or case. This goes double for your lenses! Check out our lens cases! TIP: We'll be running a sale on our full line of bags and cases with a coupon code for our newsletter subscribers. Sign up now and don't miss it! 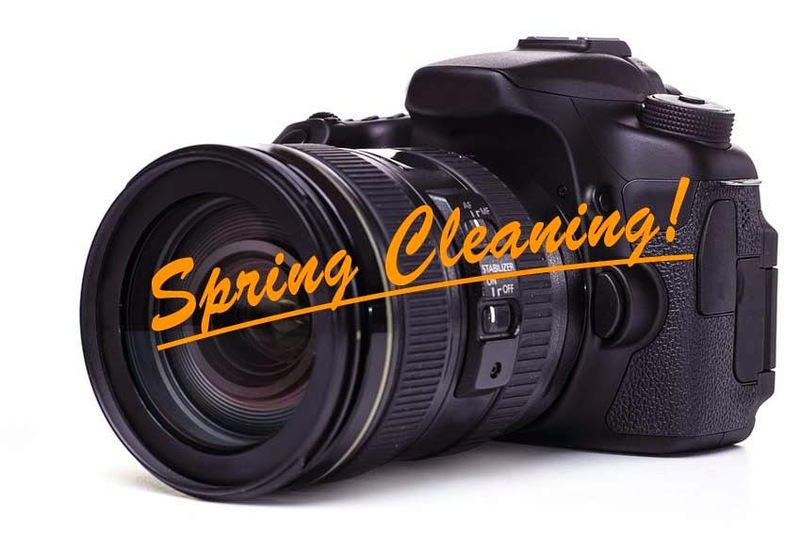 Spring cleaning doesn't have to be a chore, just think about all the photographs you'll make with spiffed up photo gear! You have talk about the spring cleaning for camera, It is important for better life of camera to use. Buy the best quality product of featured Jinbei HD610 flashlight with carry bag and battery at affordable price. Really like the post, Great information provided in this blog how to increase life of camera. Buy Canon Pixma E3177 in discounted price which is very much affordable. Nice article, these tips are very useful to increase the life of the camera. Buy CCTV cameras online for sale at an affordable price.